A large foundation was well established in their strategic direction and issue areas. Granting in three-year cycles, they were looking for innovative ideas that could be scaled and had a desire to get the most impact from their funding. With no programmatic staff, the foundation relies on Geneva Global as their philanthropic advisor to help them manage all their philanthropic activities across six broad sectors. We find creative and potentially game-changing opportunities within the foundation’s issue areas by using our global network and diverse staff expertise. 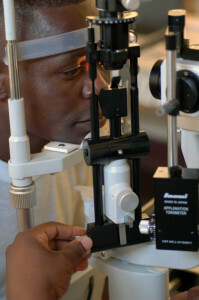 One such example was the opportunity to reduce the incidence of blindness in Zambia. Blindness was so prevalent in Northern Zambia’s Luapula Valley that it was nicknamed the Valley of the Blind. Setting out to develop a blindness prevention program on behalf of the client, we applied an integrated granting model called a Strategic Initiative. A Strategic Initiative is composed of a cluster of outstanding community-based projects, all working in a specific location and addressing a specific issue with coordinated, holistic interventions. Our metrics have shown the Strategic Initiative model leads to greater efficiencies, better results, and positive social change that continues after funding is complete. As we began the Strategic Initiative, we went to four districts in Luapula Province to understand the root causes of the high incidence of blindness and what the most pressing needs were in the community. Nearly all the causes of blindness stemmed from poverty—overburdened health care services, poor hygiene and sanitation practices, a poverty-related tropical disease that could lead to blindness, and general lack of public knowledge about proper eye care. This informed the program strategy, which focused on both prevention and treatment. We hired a local program manager to oversee the program, and we identified implementing partners, each playing a complimentary role in the Strategic Initiative’s integrated approach. For example, one partner worked with communities to improve hygiene through the provision of wells and latrines, while another organization undertook a large-scale community sensitization and health education initiative. We developed success benchmarks at the start of the program, and our active portfolio management approach meant that at times we reallocated our client’s grants to better performing organizations. Our in-depth annual reports helped the client understand what their grants had accomplished, provided stories from people whose lives had been impacted, and communicated the program’s challenges. The initial three-year program outperformed, reaching 65% more beneficiaries than was initially projected, and the results were so compelling that the client decided to scale the blindness prevention interventions into three remaining districts of Luapula Province over the course of the next four years. In total, the seven-year program positively impacted the lives of over 1.3 million people, and helped an entire province reduce the incidence of preventable blindness. Moreover, the program left behind the infrastructure necessary for sustainable impact, including trained community health care providers, a well-equipped regional hospital, and a self-funding local pharmacy. The end result of the program has changed the story of this valley, where the nickname Valley of the Blind no longer applies. Our ability to create innovative, successful, and scalable international development programs is the reason why our client trusts us to manage their entire philanthropic portfolio.